“…it breathes truth into our slogan: Beautiful British Columbia”! 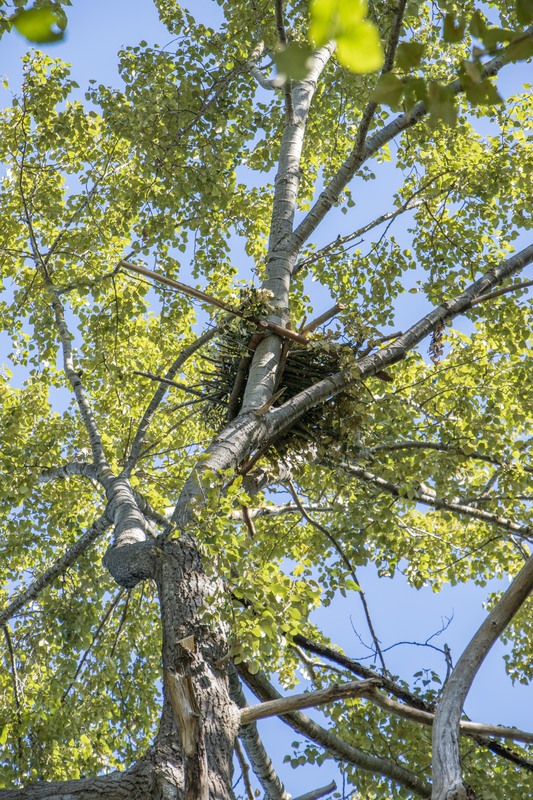 A Bald Eagle Nest and Nest Tree is the heart of bald eagle territory and this proposal is to preserve existing and develop future bald eagle nesting areas, by establishing a list of appropriate trees that can be modified or preserved for future Bald Eagle Preserves. Many urban and suburban environments, particularly the Greater Vancouver lower Fraser Valley, provide incredibly productive bald eagle habitat for both the huge wintering eagle population that passes through the area but equally important this region house the densest bald eagle breeding population in North America. For the migrating and wintering bald eagles the important habitat components are the seasonal availability of wild spawning salmon, herring and oolachin. This is of course supplemented by protein dumps at such artificial sites as urban landfills, agricultural offal and winter die-off’s, and fish carcasses from artificial spawning channels, and more recently at sites where people regularly feed eagles. Our migrating eagles also need woodlands and forests for important day and night roosts. The incredible nesting density of bald eagles in the Lower Mainland is due to the naturally productive intertidal zone surrounding the region, the even more productive fresh waterways that bisect the entire region, both of natural creeks but greatly supplemented by an extensive network of ditches and dykes that direct and hold water but more importantly host a myriad of aquatic and upland species of wildlife that feed eagles throughout the lower mainland. Additionally, but most certainly not to be overlooked is the urban production of vermin and the constant delivery of road-kills that feed eagles. And finally, just as a multi-billion dollar tax generating industry provides tonnes of food for seed-eating birds and squirrels and suet-eating woodpeckers and insectivores, there is a growing awareness of the delight of feeding the scavenging bald eagles. However, the most notable missing element in the breeding habitat of bald eagles is the ever-diminishing supply of large trees capable of supporting a large bald eagle nest. This is a proposal to retain and bring back these trees and their surrounding habitat for eagles and other species. David Hancock, an eagle biologist for over 50 years, an educator and conservationist, has increasingly been called in to “Speak for Eagles”. These calls largely come in response to the needs of industry or development to ‘cut down an active bald eagle nest’. While this development action is limited by Clauses of the Wildlife Act that offer “protection from disturbing or destroying bald eagle nests and habitat” the ecological issues, and the human values, are much bigger. The Greater Vancouver – Lower Fraser Valley is the site of the Fraser River estuary, the heart of the Pacific Flyway, is the resident and transient home of hundreds of millions of shorebirds, waterfowl and passerines that utilize the area. We residents of this incredibly productive eco-system sit at the confluence of Canada’s most productive river as it nourishes the most productive intertidal zone of the world. This is why we are home to the continents best salmon runs, provide the gateway for millions of migrants between part of their life in the United States or across South America and their northern breeding grounds and why we house the largest collection of bald eagles ever known. It is not just the purity of this river system and the waters of the Salish Sea that support our wildlife and our human life, it is how we allow this great interaction between river and sea to interact – to produce the great diversity of plant and animal life that shares this area that really is the ‘essence of providing the total ecological sustainability’ that both supports us, but almost as importantly ‘attracts us’ to this area. Beautiful British Columbia is more than a tourist slogan. It is that part of the world that still excites our primal senses, our appreciation for wild beauty – our inherent recognition that we share at great responsibility one of the world’s finest most productive jewels. Mitigation of habitat, particularly surrounding an iconic bald eagle nest, is an indicator that Beautiful British Columbia is far richer than the sum of its parts. We need development but not at the exclusion of everything that makes British Columbia beautiful and desirable. Bald Eagle Nests and their surrounding habitat are a wonderful reminder to us that we need to protect the whole! — or at least the remaining meaningful bits of it! What is a Bald Eagle Preserve? In this proposal a Bald Eagle Preserve is the diverse ecological homeland supporting a bald eagle territory – and at its heart, in some cases even defining its roots, is the Bald Eagle Nest. This proposal is planned to preserve or create suitable trees to sustain nesting bald eagles and consequently their Bald Eagle Preserve for the future. How big does a Bald Eagle Preserve need to be? Huge trees capable of supporting a bald eagle nest are essential to sustaining bald eagles through time. A bald eagle territory can include a several kilometers of linear shoreline or geographical area that supports the different ecological needs of bald eagles: for food gathering, for resting and for nesting. The Bald Eagle Preserve could be as small as a single tree that is necessary to sustain the breeding eagles that effectively forage and rest in adjacent common areas where no other nest structure exists. A single isolated tree can be the crucial element to support an entire nearby public area where eagles find all their food and resting areas – and that single ‘nest-tree element’ completes the eagle habitat needs. In other areas, a Bald Eagle Preserve can draw attention to protection of an entire diverse ecosystem that support hundreds of plants and animals — including the iconic Bald Eagle. 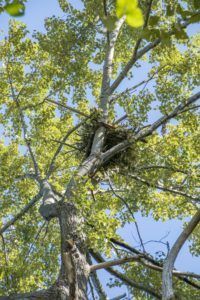 While any and every protected area preserves a multitude of plants and animals we have named this kind of preserve featuring a bald eagle nest or potential nest tree after its popular and very visible headliner! Between saving a ‘single nest tree’ or preserving a more ecologically diverse ‘parkland’ we are attempting to preserve expanding ecological units that will generate diverse habitat and the 100 through 500 years of special trees that will support bald eagles and other wildlife for the following generations. These small to mid-sized units might be City, Municipal or Provincial owned or privately or corporately owned. We all need trees, shrub lands, grasslands and waterways to feel whole. It is wondrous to visit a park, walk a public walkway or riverside trail and at times for many, it is even more rewarding, to see a single eagle in a single tree sharing our town. It breathes truth into Beautiful British Columbia. to local plant and wildlife needs. surrounding diverse habitats of other plants and animals. This tree retention and plantings are at the heart of this Tree Bank. Who administers a Bald Eagle Preserve? The Hancock Wildlife Foundation has been active for many years in both preserving bald eagle nests and supplementing trees to support new or falling nests. Over this period have come opportunities for the HWF to recommend preserving bald eagle nests on private, corporate and government properties. Recently one of these served sites have been given the “Community Recognition as an official Bald Eagle Preserve in the City of Surrey. WE are seeking to have set aside more habitat to support neighborhood wildlife and particularly bald eagles. In other negotiations our HWF plans for mitigation of bald eagle nests that were to be removed or disturbed have involved modification of trees on government land. These sites have not been given specific recognition as “Bald Eagle Preserves” but eagle nest trees have been preserved. This option gives recognition of the positive relationship between developers, the different levels of government and has preserved at least for some time the integrity of the nesting pair of eagles or presentation of options of nest nesting sites for new pairs. Similarly, the HWF has modified trees to support bald eagle nests on private lands but no official or even private recognition has officially been offered. Recognition of the landowner in these efforts might well be honored by designating these sites as “Private Bald Eagle Preserves”. The name used might be “Private Bald Eagle Nest Preserve”. And this recognition might well be given through a warm handshake, a thank you from the eagles and good thoughts from us – nothing else needed. This would not likely get, or by desire, have any legal recognition. The temporal nature of trees and eagle nests might well suggest that such a site might well “be here today and gone tomorrow” and any legal description might be unnecessary and undesirable. Note: The HWF ecological plans surrounding nest mitigation have already incorporated cooperation with a private nursery to have on hand a ready supply of approved trees and shrubs for placement in support of bald eagle nest sites. The Committee might well offer advice or even other trees to be planted around an existing nest to be mature 75 to 100 years later – all part of our long-term habitat recommendations. Development of Plans in Considering Bald Eagle Nest Mitigation. The following outlines some preliminary ecological and socio-economic considerations needed to be addressed in planning the Bald Eagle Tree Bank and the associated Bald Eagle Preserves . 1: Making up for the Past! Humans have historically displaced or defiled wildness by their occupation from the beginning of time. As we have learned, past rewards from destroying our futures ecology and lowering our own economic ecological sustainability can no longer continue if humans are to survive. And we want more than our immediate survival. We have evolved into a conscience beings that realizes our own future is dependent upon treating the world on the basis of ecological sustainability. I throw in this call for recognition because just going forward sustainably is not enough. Today we need to plan on the basis of making up for our indiscretion of the past. Today’s mitigations must make a contribution to righting the past’s errors. 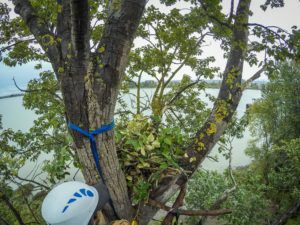 A principle advanced for the past many years has been when an eagles nest is removed, the mitigation needs to try and compensate the environment with 3 improvement options. Three instead of one — indeed. First, we cannot expect to get our mitigation options always correct by the eagles or other habitat standards that we ‘hope to understand’. Sometimes we may miss the mark and some additional insurance is needed. Second, what is at the time a locally available option may change from the eagles perspective. So the mitigation criteria is to give our best judgement as to what to do locally to facilitate the continuation of that nesting pair and territory but then to consider options elsewhere as they may be our best and only hope. Finally, on top of this we want this mitigation to help make up for our past ecological disturbances that offered no mitigation. A key here is that today we have already so disturbed much of the wildness that our efforts today must attempt to reach a little further to improve existing and additional habitat. 2: Who Can Most Afford Mitigation? Here the issue is who can legally, financially and morally be held responsible or afford mitigation for natures loss. Or turned around, the easy answer is all of us pay for the loss of quality habitat, but who can afford to now pay for the mitigation? In most cases some industry or developer is gaining some increased value to his project through removal of habitat or a bald eagle nest. Here mitigation is essential, the responsibility easily assigned and via public acceptance-pressure, it is easily and usually willingly extracted. If the property owner is a government it is also quite easy to say the government – us — should pay some equivalency towards replenishing the habitat and nest. The real rub comes when some individual wants to remove a nest for some reason, opening up a view etc. This option is still a fairly easy choice. This removal perhaps should not happen at all or perhaps he should pay some mitigation costs. He buys the bigger view, we get to mitigate this loss elsewhere. The easy rub comes when an eagles nest tree becomes a risk to life. Perhaps the tree is rotted to the core and offers a risk to nearby houses. The decision, like that of removing a bald eagle nest beside an airport runway, seems to favor commonsense and the removal permits are usually issued and I have always supported such an effort. This again does not remove options of some mitigation. 3: What is the Time Period over which Mitigation is Valuated. Confusing all the above issues of removing the ‘Nest Tree” is the real issue: How can the mitigation compensate nature, including future eagles, without us considering the loss of total natural habitat over a long period of time? The immediate loss of a nest tree is quite different and additional from the loss of habitat that would preclude eagles, and other nature, from occupying that area for years into the future. The mitigation is not just the present loss of a nest tree but possibly the potential loss of nest trees for the next 50 or 500 years. This is the most valuable concern for mitigation — preserving or recreating habitat for the future. This makes mitigation easier – or more imperative — when considering the destructive habitat loss from a commercial development or from government. The difficulty of assessment remains when a good nesting tree on private land is lost due to the aging quality of the tree. There may not be any suitable options for eagles. So this brings us to the other issue: part of mitigation requires a forward review of an entire area with the view of holding good effective habitat for the long-term. Even in areas where there are no eagle trees today perhaps we should be considering planting them as part of today’s mitigation plans. Who sits on the Bald Eagle Nest Mitigation Tree Bank Committee? HWF, Conservation member (perhaps BC Naturalists, or?) +?? – obviously any involvement with any level of government would require specific details debated with that level of government so they may not need to sit on the committee. membership or just their audit of decisions and discussion about any involvement on crown land. iii. Modifiable Trees are selected. How holds the data on the Tree Bank? This might be related to who administers the existing HWF Bald Eagle Mitigation Fund. What is the suggested short and long-term mitigation fee? Does government, Provincially or locally set this? Is it related to loss of present and future ecological damage? Is it related in part to the planned development costs? Change of land value? Who oversees the essential Annual Mitigation Nest Review? Does HWF continue this function? Usually the mitigation refers to finding a tree that can be supplemented with branches to offer the eagles a place to nest that they could not have occupied without human assistance. The bigger picture is to plan the mitigation to supply improved habitat for eagles and other species for hundreds. Where is the Mitigation to Occur? In the review on ‘where and at what costs ’ are associated with determining an optional mitigation tree, a number of pertinent questions arise. First, I do think it is desirable to attempt to mitigate any bald eagle nest or even bald eagle nesting habitat loss at or near the existing lost nest or in nearby habitat. If this was an acceptable bald eagle nesting site we should be trying to keep it or get more equally good habitat elsewhere. The practical aspect from the ‘eagle’s perspective’ is that any specific local area may have no, or even poor, practical mitigation options — at least currently. This in part is why over the years we have taken the consistent position that our first objective was to modify a tree near the original site, even install an artificial pole and nest, and then give back to eagles some additional options — usually the 2nd and or 3rd options of the mitigation recommendations. These latter options were always modification of an additional tree (or two?) at some other location to be decided later. My point is quite simple. The mitigation should encourage eagles to retain their original territory, the place they have selected as having adequate food, protection and nesting habitat to succeed. When mitigation is required we should be aiming at improving the generally constantly degraded bald eagle habitat and try to both retain eagles in their original habitat and to also encourage them in areas that have also lost them — or at least could sustain them if the nesting options were increased. So what I propose is to establish a “Bald Eagle Nest — Tree Bank” a bank of modifiable trees that can encourage bald eagles to finish the nest. 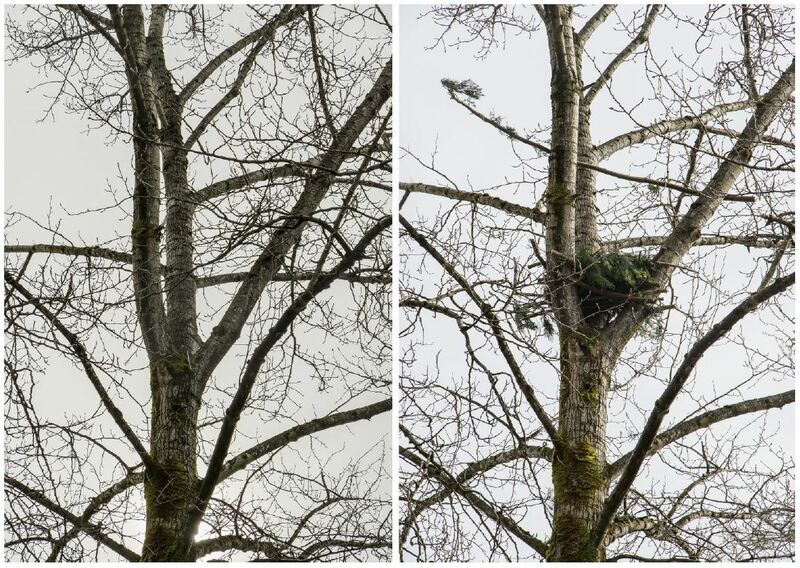 This Tree Bank could be anywhere but our proposal is meant to apply to the heavily disturbed ecology of Greater Vancouver and the Lower Fraser Valley where the limiting element to bald eagle nesting success is the loss of trees capable of supporting their nests. We would survey the lower mainland government lands and private property. We would find trees that could be modified to accommodate bald eagle nests. These trees could be utilized by people wishing to support a bald eagle nest or be required to mitigate some bald eagle nest or habitat loss. I can see this project revealing 50 to 100 trees that would effectively support bald eagle nests spread throughout the lower mainland. 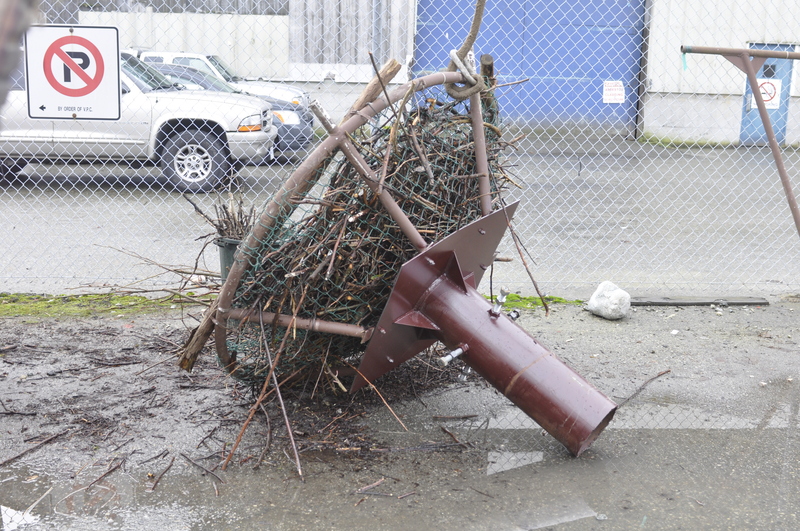 We would attempt to find trees in all or most of the lower mainland municipalities. The choice of trees would favor trees that are presently outside existing territories or even within bald eagle territories so some alternative tree is ready. This BENTB could be utilized even when an existing nest tree is lost due to wind or natural causes. This event happened at our Delta 2 Site the previous September when a freak storm snapped our Delta 2 nest tree in half. 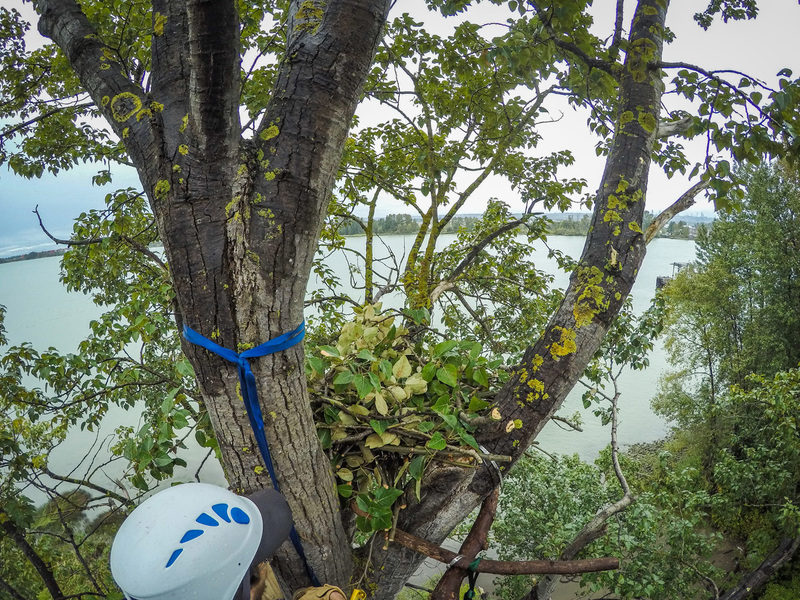 Within 24 hours we had rebuilt a nest in a nearby tree and when the parents returned to the territory 2 weeks later from migration they instantly accepted our new modified tree. Literally the same thing happened at our White Rock nest cam site. 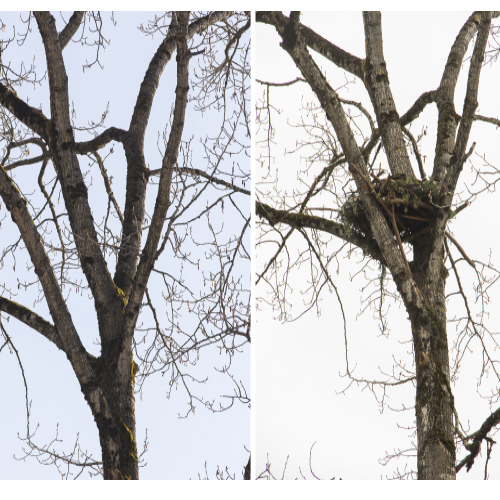 The nest fell and when the adults returned we had given them a new modified tree and they accepted this within 2 days. We understand how to give eagles a suitable nest structure on which to continue building their home. 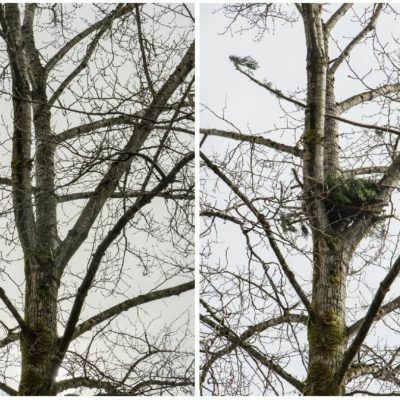 This ‘modifiable tree bank’ could be a totally separate resource or it could become part of and perhaps receive funding from another Hancock Wildlife Foundation proposal: the Bald Eagle Nest & Habitat Mitigation Fund.